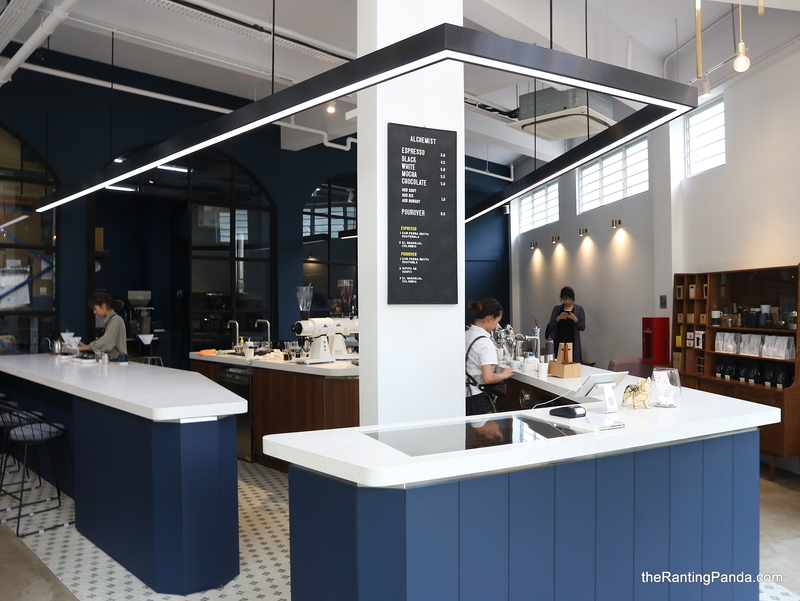 The Place With two other outlets at Hong Leong Building and International Plaza, Alchemist coffee recently opened its flagship space in Tai Seng at an ex-biscuit factory space, Khong Guan Industrial Building. The building is quite uniquely designed in the sense it resembles a pointed triangle at a cross junction, which somehow reminds me of the current Potato Head in Keong Saik Road. As with Alchemist, the Khong Guan space has a clean look with predominantly dark blue and white shades. There is a good dose of natural light through the two rows of window seats, while the coffee laboratory-like space takes centrestage of the design. There is also a fair bit of furniture being injected into the space, such as the retro sofas and shelves to house their in-house coffee products. The Food Not much food options on the menu to speak of, as the focus is really on the coffee. There is a modest selection of bread such as croissant, though the caveat is that these are by a supplier and not prepared in-house. In any case, food is not our focus here. For coffee, opt for the Pourover (S$6), Espresso (S$3) or White (S$5). You can always try to request for a customised drink if you fancy, of course. We went for the Flat White (S$5) and Black (S$4.50). The flat white is slightly acidic, with punchy notes. Comparatively, the Black coffee is quite strong, and effective in awakening our panda senses. Rants The lack of food options may not be the most welcoming. That said, the brand of Alchemist comes across as more coffee focus for sure. Grab your grub before heading over, that’s our take. Will I Return Again? Cafe space like this is hard to come by in Singapore, where you are literally the only prominent F&B concept. It may not be in the most hipster district like Tiong Bahru or Keong Saik, but I like this industrial charm. Drop by to have a quiet cup of coffee, while the peace lasts. Interestingly, we also have another new found favourite coffee in Tai Seng, which is Ristr8to located at the other side of Tai Seng. Life is always better with coffee, and options.